Figures released under the Official Information Act show that during 2007 2,860 beneficiaries left welfare to go to prison and 3,171 inmates left prison to go on a benefit. According to welfare commentator, Lindsay Mitchell , the current prison population is around 8,000. "These figures raise a number of questions, " she said today. "Firstly, the public assume that if benefits are not paid to certain individuals , crime will increase. However these statistics prove that people receiving benefits commit crime anyway. Secondly, does the benefit system have any sort of moral compass when people who have repeatedly broken the law, who have committed the most serious offences, are still entitled to taxpayer support? Thirdly, how successful are prisons at readying prisoners for release if they are cycling on and off benefits? Does the availability of welfare on release undermine the motivation to learn new skills while incarcerated? And finally these figures show that being on a benefit more than doubles the risk of imprisonment. What research is being done into the backgrounds of prisoners? How many were raised on welfare? It seems to me that while it is vital to create better policies to deal with the present levels of crime, far more attention needs to be paid to state-funded lifestyles that lead people to crime. Ultimately, relieving able people of a responsibility to support themselves relieves them of life's very productive purpose - working to survive. " He also denounced methamphetamine or P users as participants in an evil trade and said dealers should be tried as murderers. So why not try supermarket check-out operators who sell alcohol "as murderers"? Oh right. They don't have evil intent and 'P' dealers do. Actually 'P' dealers want to make quick, easy, serious money. The illegal status of 'P' makes it difficult (but not impossible) to make and sell. That combined with the high demand results in high prices and high profits. In response to a question about the P epidemic, Mr Wikiriwhi said prohibition was not the answer and legalising cannabis would result in less P use. He's got a point. As it is we have created a recreational drug black market of immense proportions and very dark dimensions that cannot be destroyed even using all the force that the state can muster. And yet nearly every political party and candidate continues to pretend that it can. I asked if Nia's torturer's fitted a profile of child abusers. Yes, she said: "Impulsive young males. Poverty. Drug and alcohol background. What I call the normalisation of violence within the family. A tolerance for really quite aberrant behaviour, for thinking that it's OK.
Did that profile include being Maori? "There is a particular issue for the Maori community," she said. "It is true that Maori disproportionately hurt children. But out of 88 children killed between 2002 and 2006, 48 were Pakeha. Maori were 28. The remainder were Pacific Island and a few Asian. So I think people need to get a little bit careful when they start on this business." At the time I questioned the figures on this blog. 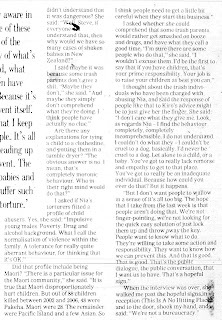 In September 2008 another journalist, Keri Welham, interviewed Kiro for the Dominion Post weekend magazine. Welham reproduced the same figures. I blogged again pointing out that if these figures were correct there had been a very large increase in child deaths since 2003. This time I decided to investigate. 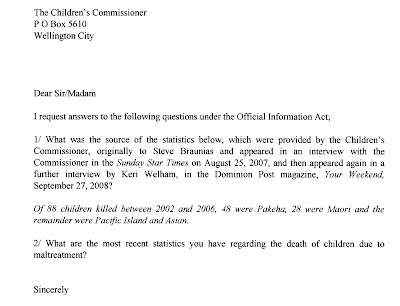 I rang the Office of the Children's Commissioner and spoke with their 'media' person who promised to call me back when she had located the source of the statistics used in the Dominion Post magazine article. I called her again the next day and she told me that the source was not their office but the article by Steve Braunias. At which point I realised I was going around in circles as Cindy Kiro has been the source for the Braunias statistics. So I wrote to the Commissioner under the Official Information Act. My letter follows and her response below. "The figures were indeed direct quotes from Cindy Kiro, made to me during the course of the interview. I didn’t discuss any aspect of the story afterwards with her, and there was no call made on her to make any kind of retraction. Good on you for following up on those figures, though. Interesting!" We now have statistics in the public domain that are grossly inaccurate. That a second journalist used them proves people will access the information and treat it as official and accurate. The Children's Commissioner knows they are inaccurate and has a responsibility to set the record straight. That she has failed to do so amounts to a cover-up of her mistake - accidental or otherwise. 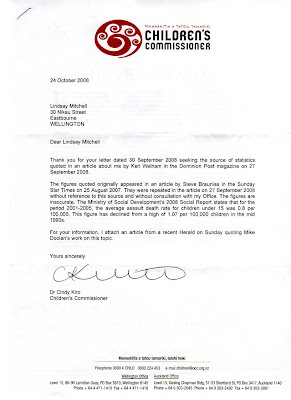 Note the Commissioner's letter says that for the period 2001-2005 the death rate was 0.8 per 100,000. That's approximately 7 deaths or 35 over a 5 year period. In the context of a discussion about child abuse, claiming 88 children were killed over a five year period only one year removed, and that a majority of them were Pakeha, AND never attempting to correct the statement, is quite reprehensible. I personally believe she used those erroneous figures to rebut claims that child abuse is a Maori problem. Of course child abuse is not exclusively a Maori problem. But more Maori children are killed through maltreatment than would be the case if their statistics reflected their proportion of the population. According to the New Zealand Herald Cindy Kiro's contract is up for renewal this year. What has she achieved? She should go and so should her department. This guy deserves the vapid Peter Dunne. Hell. Some economical austerity is exactly what we need. 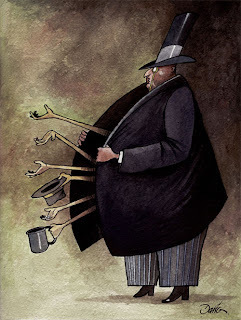 Rich government, poor people.